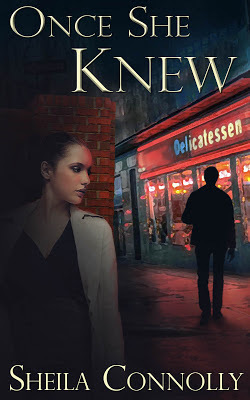 Last month you met Claire Hastings, from Sheila Connolly's ebook Once She Knew. It seems only fair to let Jonathan Daulton, Claire's sort-of partner in crime-solving, tell his side of the story. I never meant for any of this to happen. Seriously. Look, I was invited to give a speech at a women's college in Maine—that sounds innocent enough, doesn't it? Okay, it was for all the wrong reasons—mainly because of that book I wrote in an angry (and, I'll admit, drunken) funk, because the woman I had been seeing dumped me. Well, in hindsight I have to say she was right to dump me, because I was never around, and when I was, I wasn't paying a lot of attention to her. But it hurt, and I poured all that out in a crappy book. Which sold really, really well. In case you haven't noticed, the universe is not fair. Since then I've been trying to re-establish myself as a credible journalist, which isn't easy with that stupid book hanging over me. But the college talk paid well—heck, they even called me something silly like Artist-in-Residence—and I needed the money, so I said I'd do it. It was handy because one of the professors at the college was an old pal, and she let me stay at her place, except she wasn't around, but this cute young housesitter was. I know what you're thinking. No, I didn't hit on the housesitter, but I did watch her shoot an FBI agent who showed up at the front door, and then I did the manly thing—I ran like a scared rabbit. But it was dark, and I kind of fell into a lake, and that's how I ended up stumbling into Claire Hastings' cottage in the middle of the night. Claire and I have a history, sort of, but neither of us wanted to talk about it. She was all set to send me on my way, and she was even okay with it when I told her that I had reasons not to get involved in an FBI investigation at that particular moment in time—no, I can't tell you about it, because… Never mind. Anyway, that didn't quite work out, so I had to kind of kidnap Claire and drag her across several states to take care of that thing that I can't tell you about. But Claire was great. I mean, really great. Once we were in the middle of the Thing-I-Can't-Talk-About (for the details, you'll have to read my book when it comes out next year, with the blessing of the FBI), she was a real trouper, and I have to admit she bailed me out of some sticky situations. I guess I should be thankful, and I really have to admire her, even if she is kind of an aggressive feminist. And I think she's hiding a romantic streak under all that feminist rhetoric. I plan to find out, just as soon as I finish the book.